Through the years, people have created different ways to get around the golf course. There is Disc Golf, played with metal chain link holes. Recently, FootGolf has become a fad with a soccer ball being kicked around into large holes. Now, meet FlingGolf, a new way to get around the golf course that allows you to use regulation golf balls and a FlingStick. Sound strange? Picture a game where golf meets lacrosse. 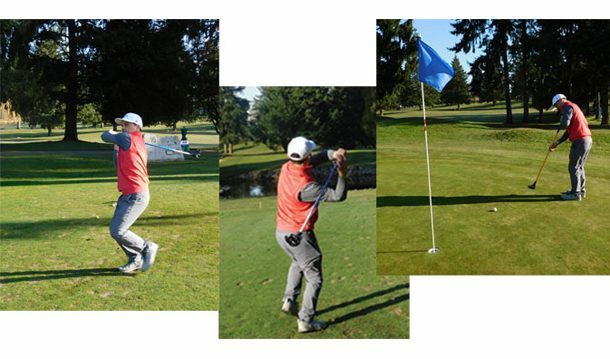 At Allenmore Golf Course in Tacoma, FlingGolf is taking off. Assistant professional Johnny LaBelle told General Manager Craig Moore about the idea, when they were trying to figure out new ways to get people to their golf course. FlingGolf was a hit at the PGA Show in Orlando a few months ago and LaBelle decided to give it a try. It was love at first fling. The Fling Stick looks like a typical golf club with a standard grip, but the end is more of a scoop for the ball called the channel. To fling it, a player looks a little like Happy Gilmore, running up to the spot where the ball was picked up and then flinging like a lacrosse shot. Unlike Disc Golf and FootGolf, FlingGolf can be played on a typical course. In fact, you can play it while your buddies are using their regular clubs. No golf bag needed, either, just you and your Fling Stick. For distance, a regular golf driver goes further, but with practice fling shots can travel over 200 yards. And the FlingStick can also be used as your putter too. Alex Van Allen, who lives on the east coast and realized the popularity of both golf and lacrosse, invented the sport. Allenmore is going all out to promote the fact that it is the only course in the area to offer FlingGolf. The course has started FlingGolf Friday’s, giving players a chance to test the game and get their hands on FlingSticks at the same time. There are a variety of Flingsticks, Launch model, Stinger model and Ballistic model. Sticks go for around $100 said LaBelle and come in different lengths with the shorter sticks are easier for more control. Griffin Golf with Sara and Chris Griffin have put into play the PGA Junior League and Operation 36 at Allenmore, Operation 36 is a new system to help grow them game where players track their journey looking to shoot 36 from their full tee box. New faces are also on hand at Allenmore Golf Course including assistant Hagen Dickinson and shop assistant Brian Wilk.